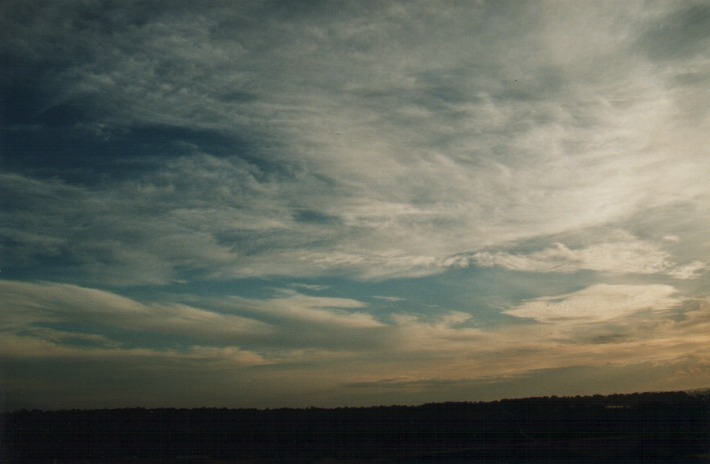 Conditions were expected to be ideal for a severe weather outbreak - even supercells were on the draw. The models on the same morning of the storm indicated a good shear environment for supercells particularly to the south west of Sydney. Also ideal were the forecast CAPE (particularly to the north or northwest) and Surface Lifted Index (-3 to -6). Generally speaking, there were a few target areas which made it a difficult decision. Chasing south of Sydney would get us into the area under maximum jet potential. Chasing north into the Hunter region to me was better especially later in the day and was an option. 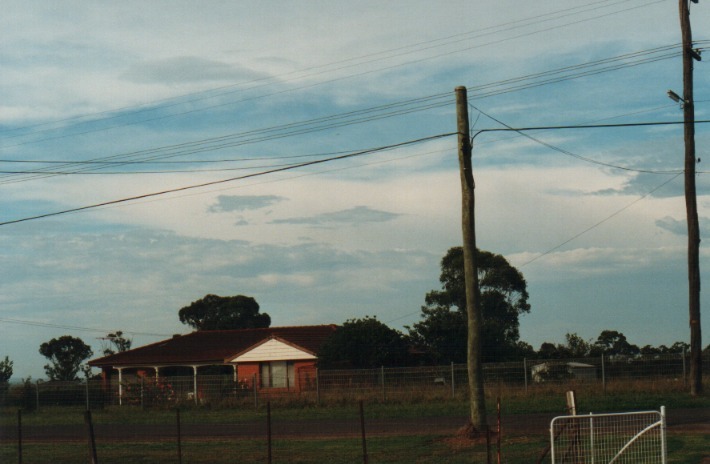 To the west, storms were already developing and my thoughts were that these storms and the whole system would eventually reach the Sydney area. 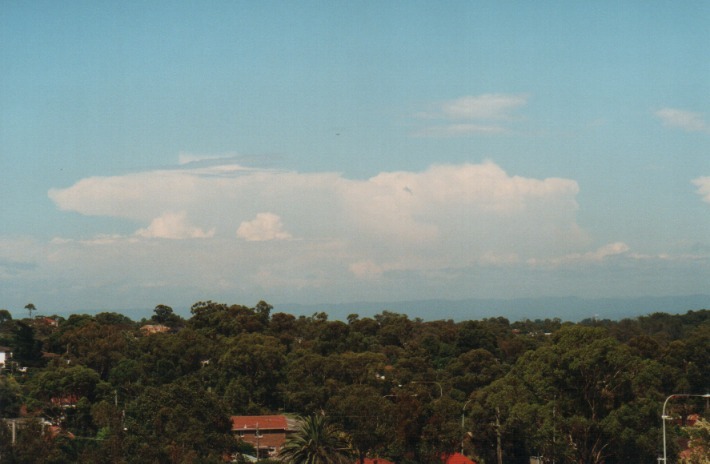 A storm had already developed from south of Bathurst during the early morning period (about 7:30 to 8am) and tracked southeast towards Wollongong. The satellite picture infrared image showed a dry line stretching southeast to northwest through around Orange and also up to the Northwest Slopes. 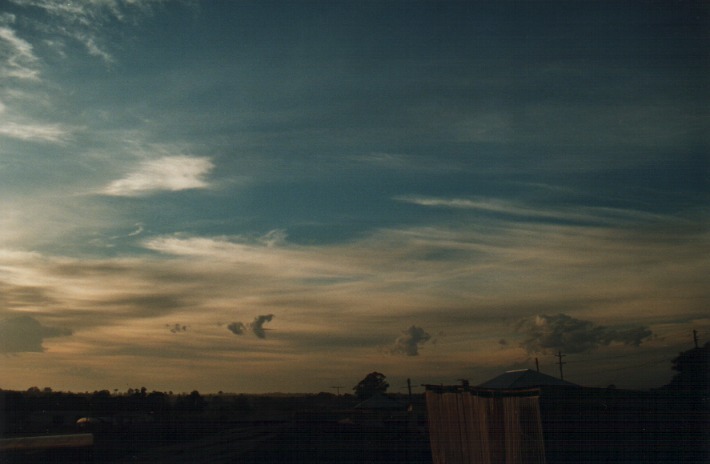 An active cold front was situated along the south coast with cold air aloft behind the change. 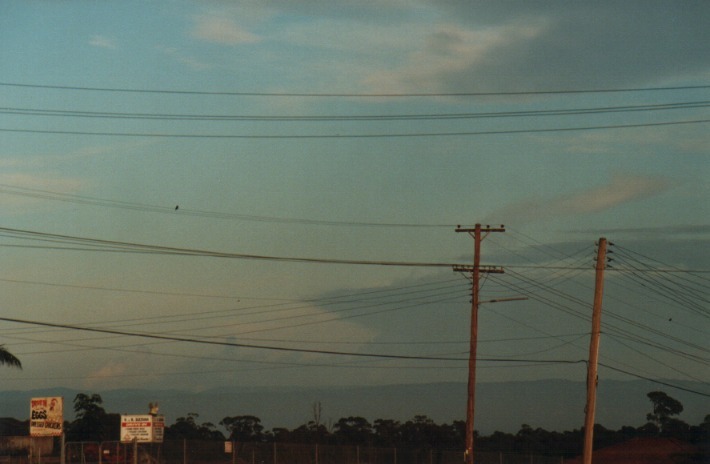 After discussing the situation with Matthew Smith, Ben Munro and Daniel Weatherhead, it was decided to meet at Rooty Hill and watch activity from there. We could always get updates. 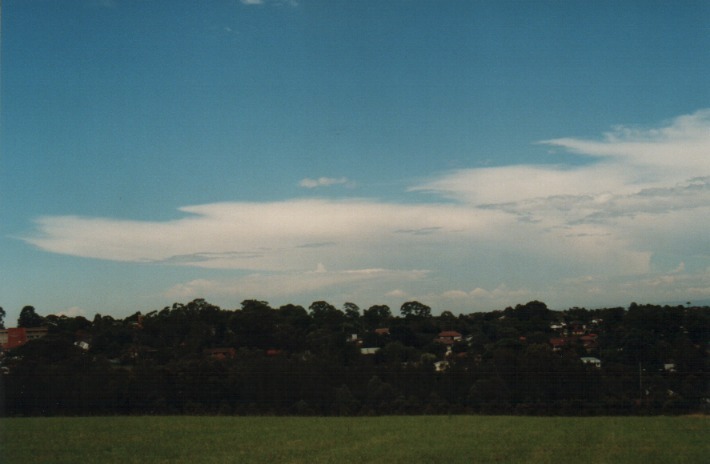 We met at Rooty Hill by around 9:30am and could already see towers trying to punch through the atmosphere. 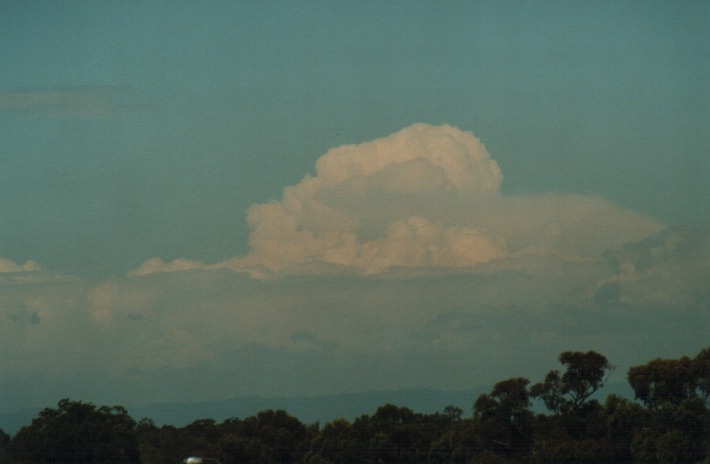 By 10am, three major large cumulus exploded through the cap and within 10 minutes had formed substantial anvils facing SE. It seemed the anvil especially evident on the southern most storm was bent in other words slightly circular. 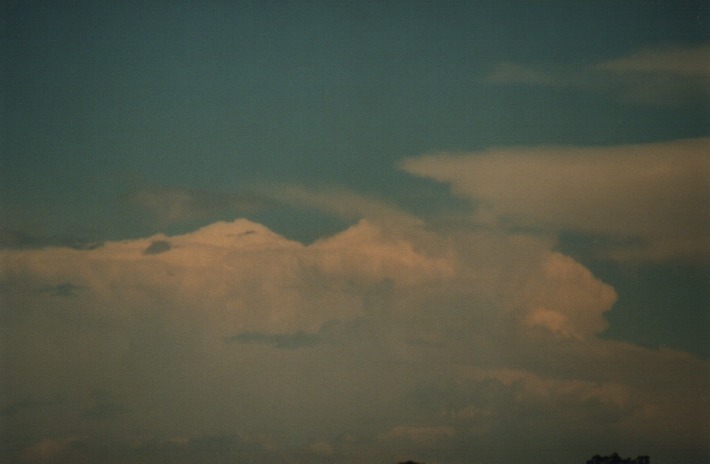 I believe that these may have been supercells from the structure and explosive development. Radar showed that hail was reported out of these cells by 11am local time. As was to be expected from the strong middle level winds, the storms were already tracking rapidly towards Sydney. Unfortunately, I could see they were developing into a squall line system as they gradually merged. 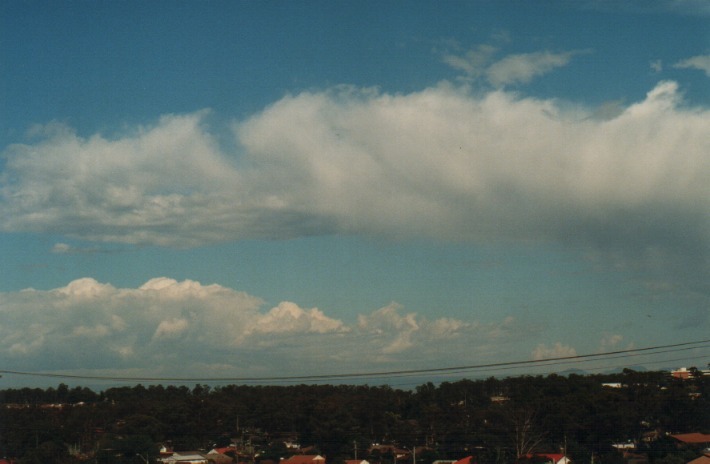 This system approached Sydney by 12pm and the anvils hiding the intense radiation from the sun was more a relief. We had decided that we would head into the Hunter but during a refuel stop at Windsor, decided against it. My initial reason to chase into the Hunter was because it tends to fire in most occasions when a squall line approaches Sydney usually with massive storms under a high CAPE environment. The reason I changed my mind was because of the intense heat and driving along the Putty Road for two hours simply didn't appeal. It also seemed that since the jet was stronger to the south, that we should stick it out near Sydney and be ready to head south if need be. From Richmond, we could see a small cell had developed along the front section of the weakening squall line anvil. It was a small but quite intense updraught and had already punched the anvil layer. We decided to invetigate. 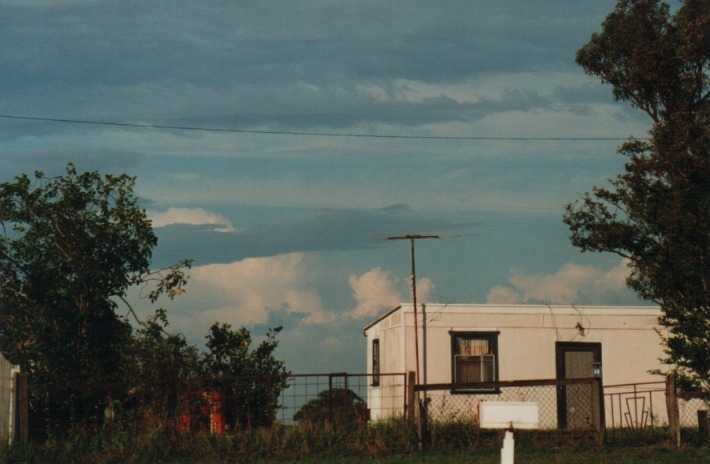 It was not until around the Luddenham area that a dense precipitation cascade region and an indication of possible hail falling from these areas. We could also see through a now large clear break that storms were popping up further to the south and south west. One particular cell had an overshoot and they seemed to have developed perhaps near the area of the earlier storms. And again the most prominent cell had developed closer to the jet maxima. After a brief stop with photographs and video, we headed south towards Camden to meet up with David Croan and Paul Graham. This activity seemed very encouraging. But after a lengthy conversation getting an update, I could see a clearing. 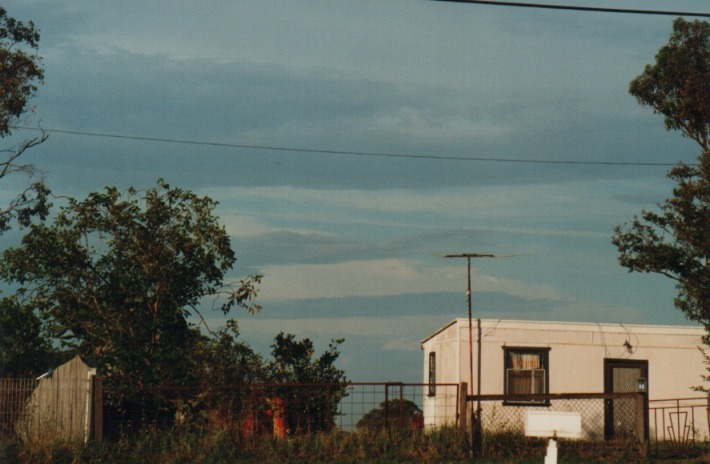 Just outside Camden, it had dry line written all over it. 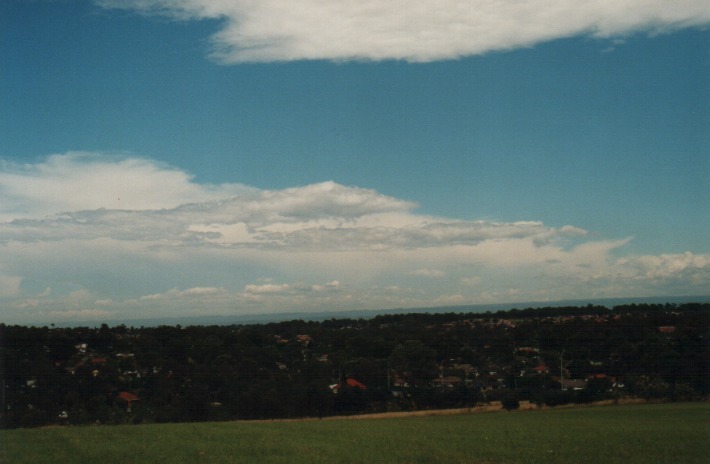 There were dwarf cumulus to the west and a dissipating cell towards the Bathurst region. The dry air had moved through and soon thereafter, the wind change direction from north to west. 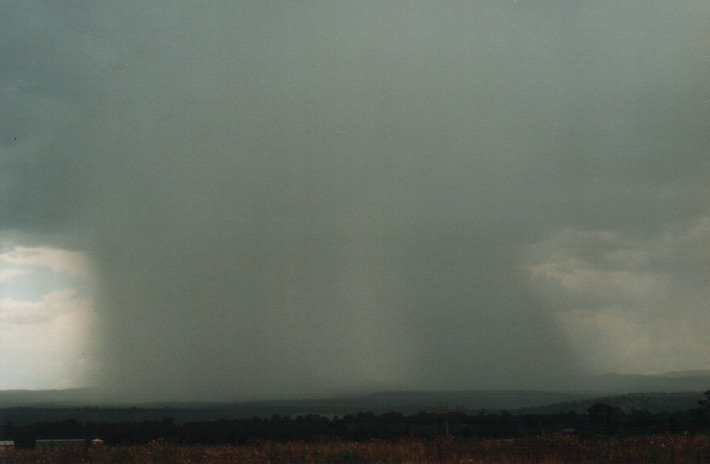 A major cell was moving towards the Nowra region. But even this was not very large. It seemed Sydney had done it again!!! A dry line had moved through for the third time this season and all the action was going to occur off the coast. 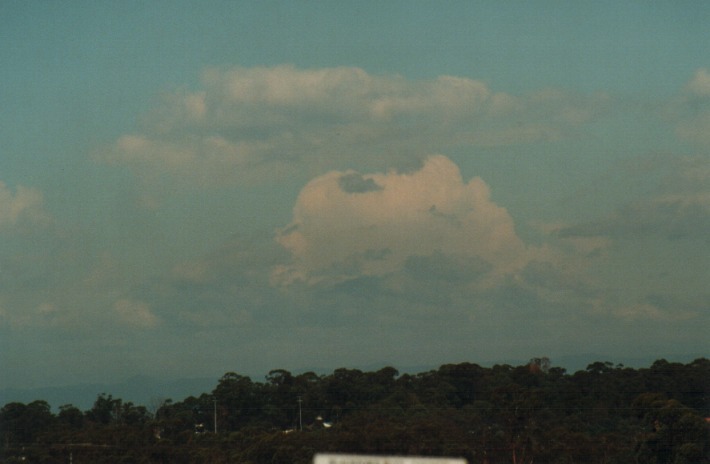 There had been warnings for the Sydney region but nothing eventuated. We watched this cell become a little stronger as it hit the moisture of the ocean. A call to Michael Bath confirmed that this storm had developed a more severe structure off the coast. 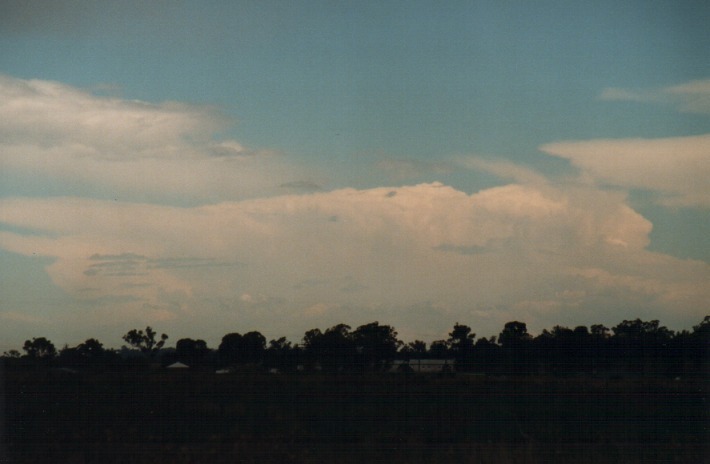 To add to the insult, there were storms in the Hunter near Cessnock, Muswellbrook and Scone with probable hail! It was now late afternoon so we decided to head home. I do believe that something was wrong this day: either the cap was too weak meaning storms were exploding but too widespread in most cases. Or the upper most level was not as strong as necessary to match the middle level flow. Thankyou to all those who provided us with updates - particularly James Harris and Michael Bath.